Hi, friends!! 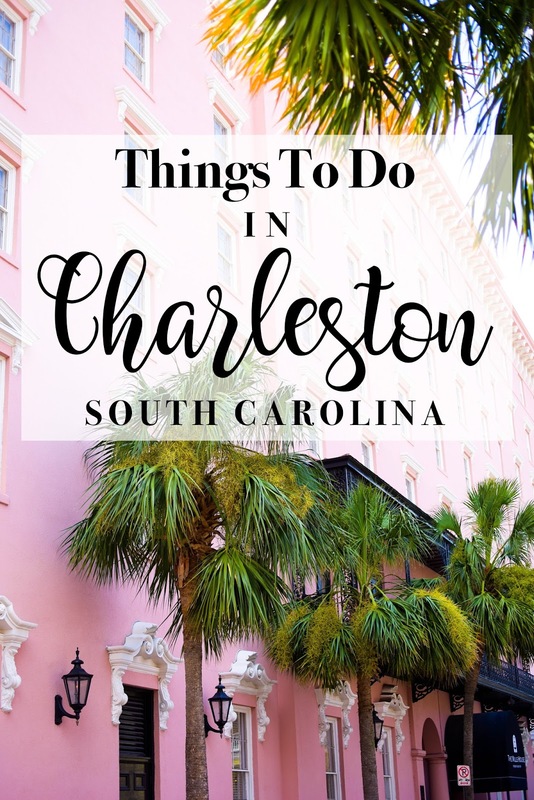 After spending the most amazing weekend in Charleston, I wanted to share some of the best things you can do there! 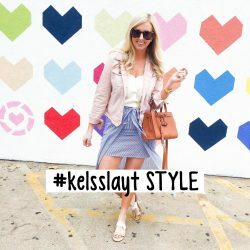 I jetted off to this gorgeous city with my best blogger friends Sara & Cortney. These girls are SO sweet & we always have the best time together! We had 4 days full of laughs & all the girl talk! 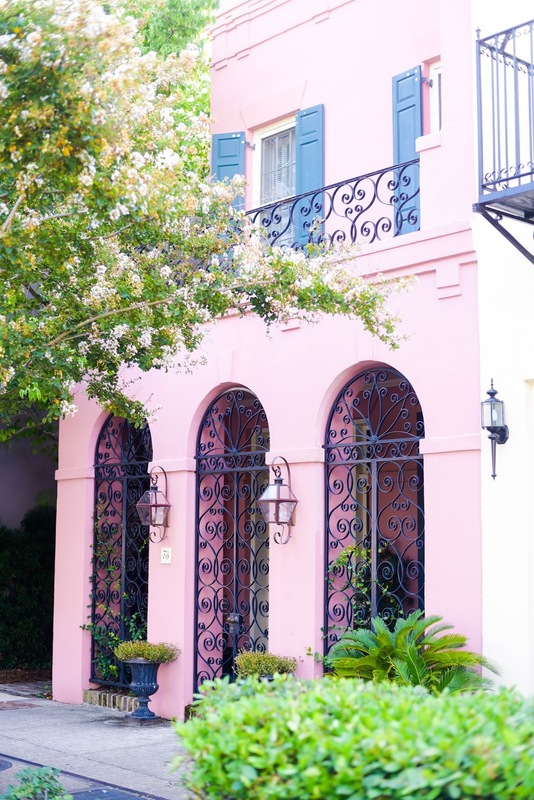 I think Charleston is the perfect destination for a girls trip but also has a romantic vibe so it would be a great getaway with your significant other too. I’ve traveled to many places in the past few years but this definitely ranks up there as one of my favorite cities ever! 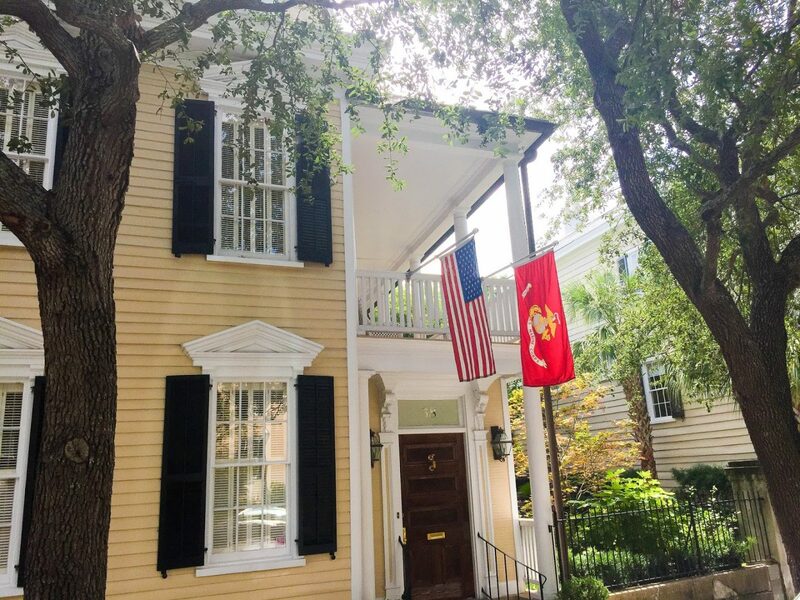 If you’re planning a trip to Charleston soon [if you’re not- you should be!!] I’m breaking down the best things to do in 5 categories below: See, Savor, Stay, Shop & Spin! 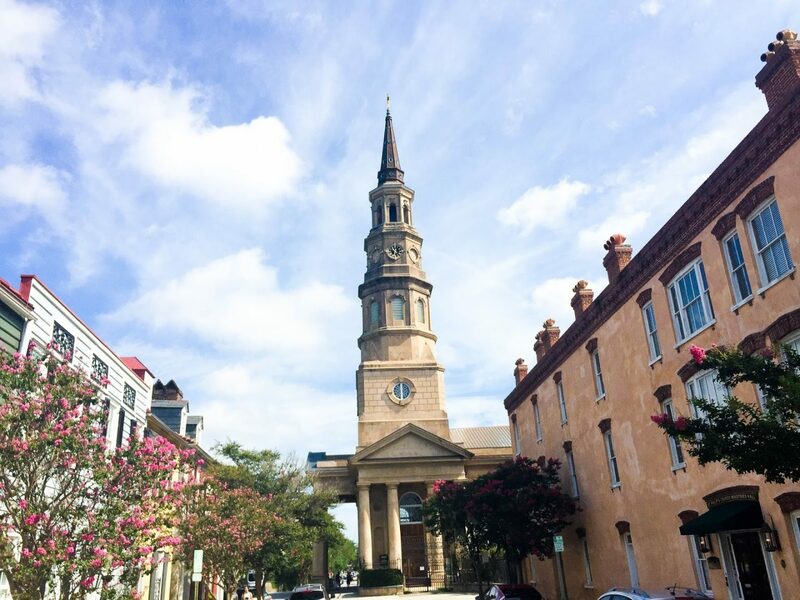 There is seriously SO many things to see in Charleston! I plan on visiting again soon with Jake to see some of the things I missed this trip: USS Yorktown, South Carolina Aquarium & Fort Sumter. 1. Boone Hall Plantation: This place is stunning! 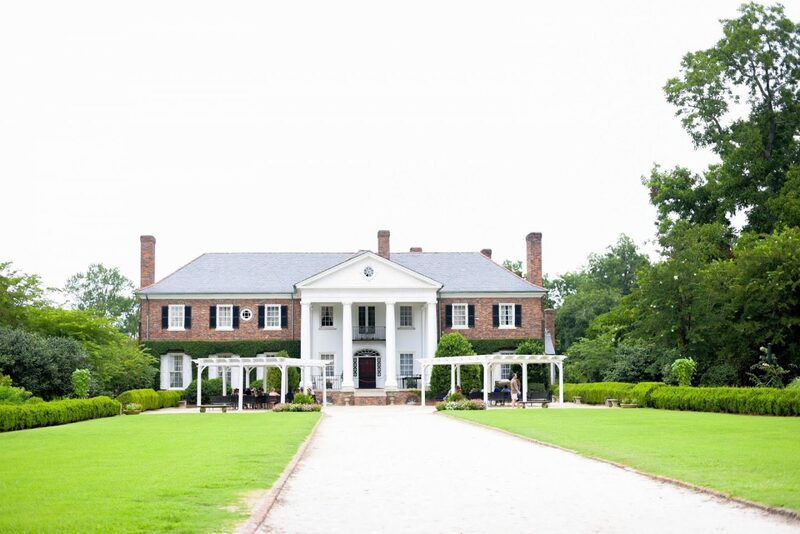 Full of both history and beauty, it’s known for its original slave cabins and the Avenue of Oaks. 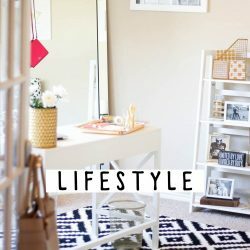 Definitely take the house tour while you’re there! You can get some of the best pictures here too. 2. Sullivan’s Island: This is a small town with a gorgeous beach! Take a day & put your toes in the sand. Bonus points if you can get here early to watch the sunrise over the beach! 3. 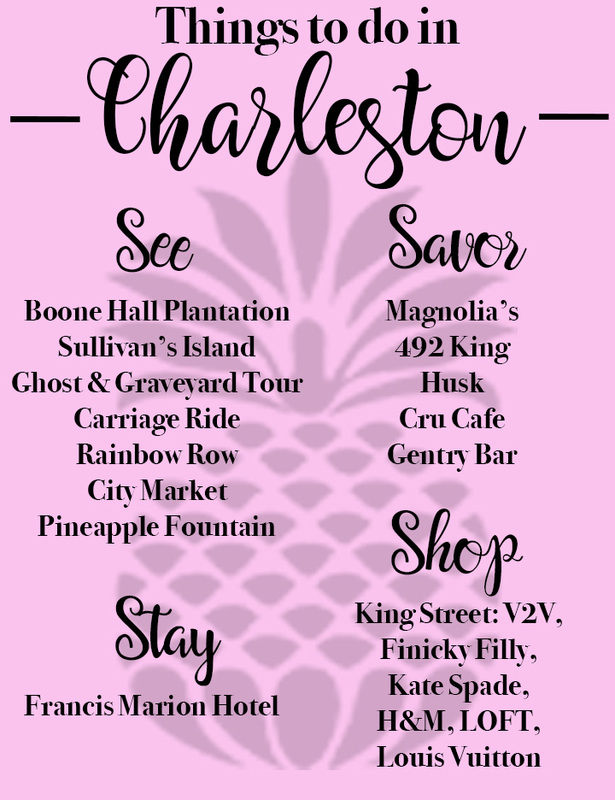 Ghost & Graveyard Tour [BullDog Tours]: We did this on our 1st night & it was a great introduction to Charleston’s history and the city layout. It’s a walking tour so wear comfy shoes! 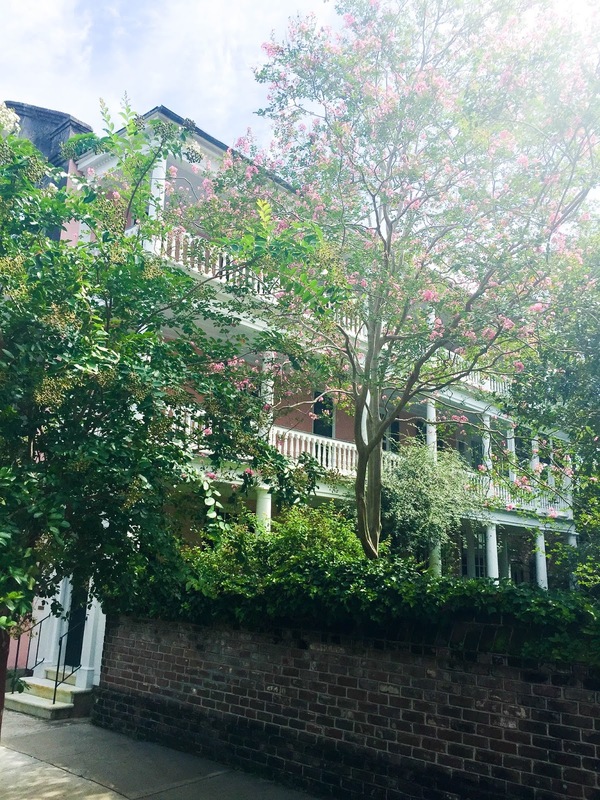 You’ll get the chance to walk around the heart of the city, learn more about the past of Charleston & possibly get spooked along the way! 4. Carriage Ride [Old South Carriage]: One of my favorite activities of the whole trip! 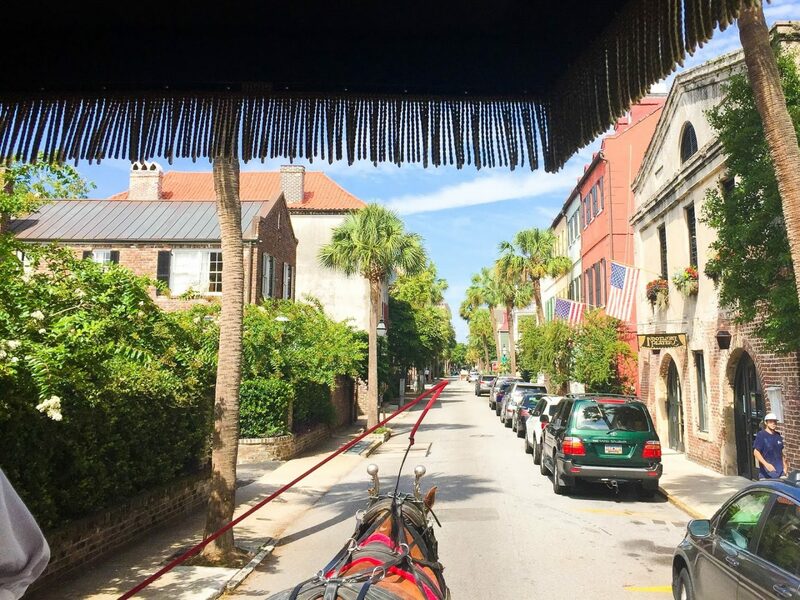 Sit in a horse drawn carriage & adventure around the charming city of Charleston. Our guide was so funny & incredibly knowledgeable. It was a beautiful way to see the streets lined with colorful homes and history at every turn. Plus, who doesn’t love horses! 5. Rainbow Row: Probably one of the most iconic places in the entire city! 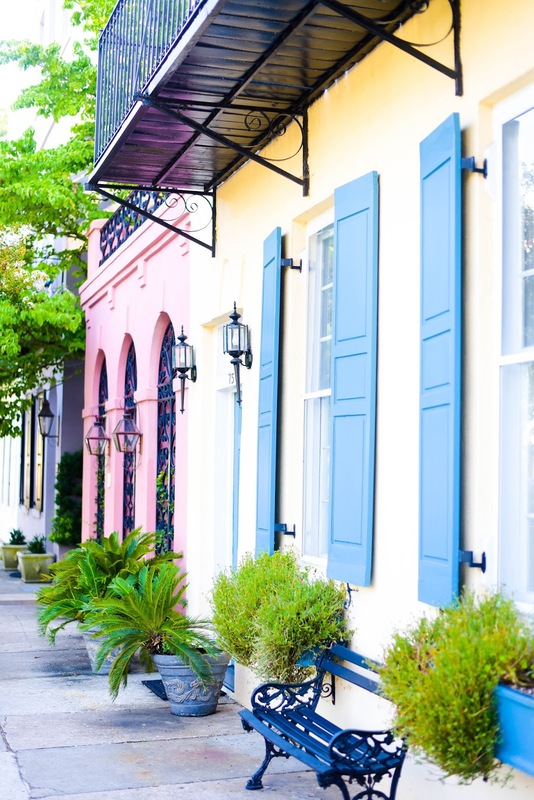 It’s a row of pastel colored homes that are just stunning. Several of the pictures below were taken from here! If I ever stumble upon $2 million dollars, you can bet I’ll be buying one of these historic beauties! Tip: This would be a great part of the city to rent a bike and drive around. 6. City Market: This is another historic part of the city that is now the tourist center. You can buy every souvenir imaginable here! We had so much fun just browsing through all of the vendor booths to see the amazing hand made goods. 7. 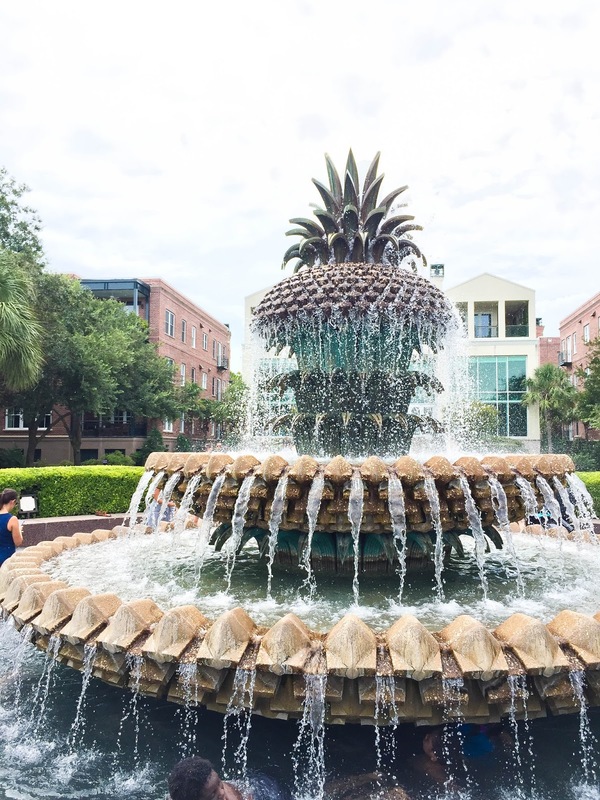 Pineapple Fountain: This is another well known symbol of Charleston! Pineapples are a huge part of southern culture as they represent hospitality. If you visit on a hot day, this is a great place to come cool off because it’s also a wading pool! Ok, so this is the toughest to narrow down! I swear, we ate our way through Charleston! ha! There’s SO much good food & I think it would be hard to go wrong. Here are some of the places we ate and seriously LOVED! 1. 492: I had the swordfish & it was amazing! You also can’t skip out on dessert- especially the s’more concoction! So good! 2. 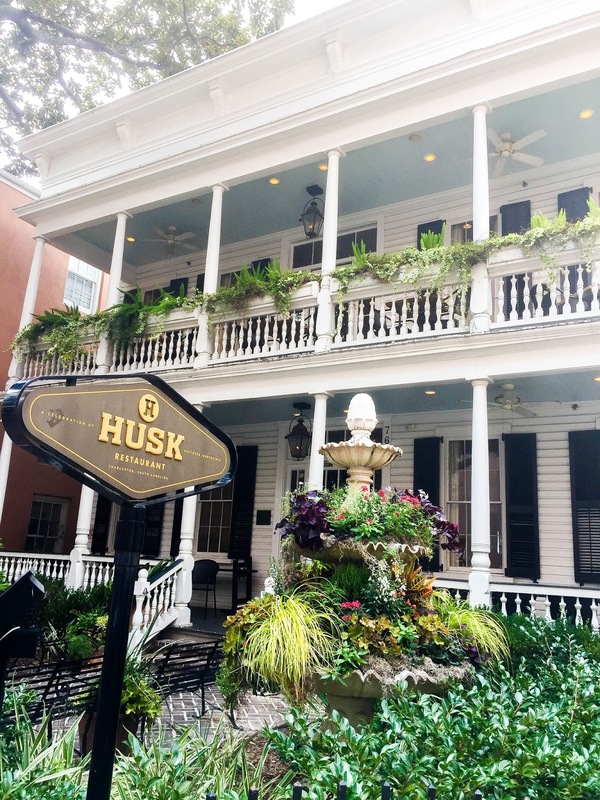 Husk: Their menu is pretty unique but everyone loved what they ordered so it’s obviously worth trying something different! I got the BLT with fried green tomatoes. The pimento cheese appetizer was also delish! 3. Cru Cafe: This place had a great vibe and the food was all good! We got to sample tons of their appetizers before our meal and they were perfection! 4. 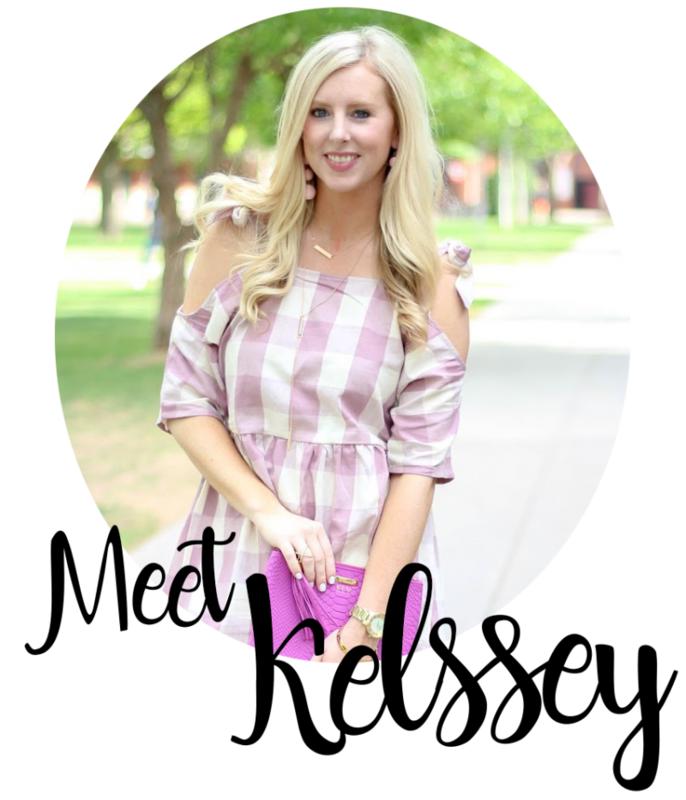 Gentry Bar: Any Southern Charm fans here? It’s one of my favorite shows on Bravo so when I found out we were going here & JD was going to be there- I was PUMPED! It turned out to be a rather ‘interesting‘ experience. I think I might be less of a fan now. lol But the crab cake apps were so good! 5. Magnolias: This might have been my very favorite! We got the salmon deviled eggs- YUM! And I got the Crab Cake Sandwhich which was to die for. Seriously, this is a must! 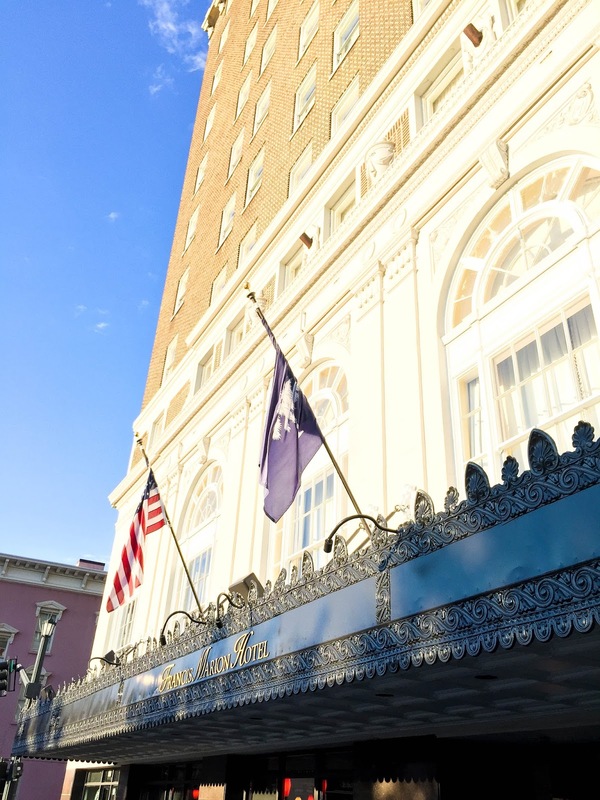 We stayed at the Francis Marion Hotel & I honestly can’t imagine that there is anything better in all of Charleston! So first, the location. It’s on King Street which allows you to walk out the door & to almost anything you want to see/do! You can take a right & hit up all of the best shopping or take a left and cruise through the best restaurants and bars. There’s also a park across the street that hosts a huge Farmer’s Market every Saturday! The hotel itself has a great restaurant, a convenience store [where I got my daily Red Bull- ha!] and a Starbucks. The rooms at Francis Marion are so incredibly charming! They have a historic feel but with all of the updated amenities. We were on the 10th floor & had a great view of the entire city! I really can’t recommend staying here enough! The lobby is stunning, the staff is incredibly friendly and it definitely was a treat to call it home for the weekend. Ok, so no blogger trip is complete without shopping! Since our hotel was just steps away from the best shopping on King Street, I took advantage a few different times! All within a few blocks of each other you can find popular favorites like Kate Spade, Loft, Banana Republic and H&M. 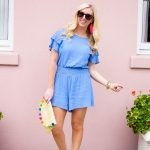 There are also tons of great local boutiques that you don’t want to miss! V2V, Finicky Filly and SHOOZ are just a few of the ones I loved popping into. 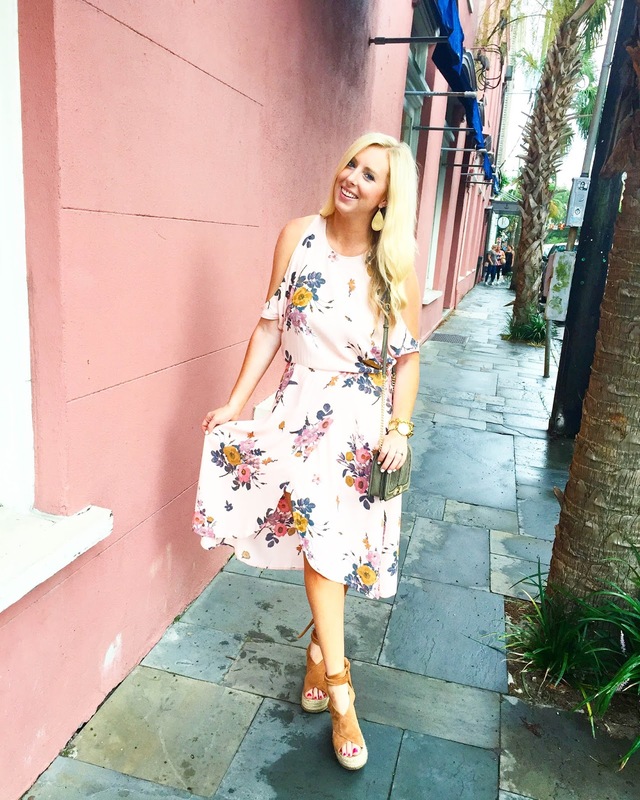 Charleston is definitely the place to wear your bright outfits as the colors in the city are just amazing! 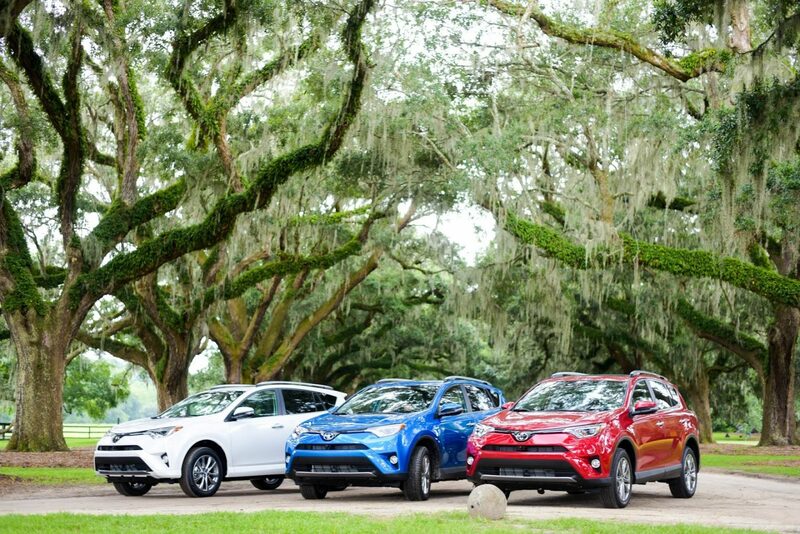 Our wonderful Charleston trip was made possible by Toyota. They were kind [& trusting! ha!] 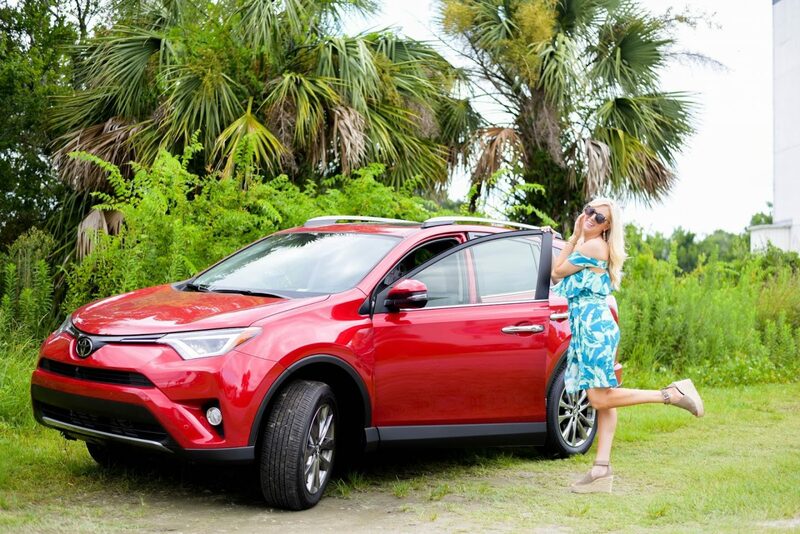 enough to lend us a brand new 2017 RAV4 to cruise around in for the weekend. 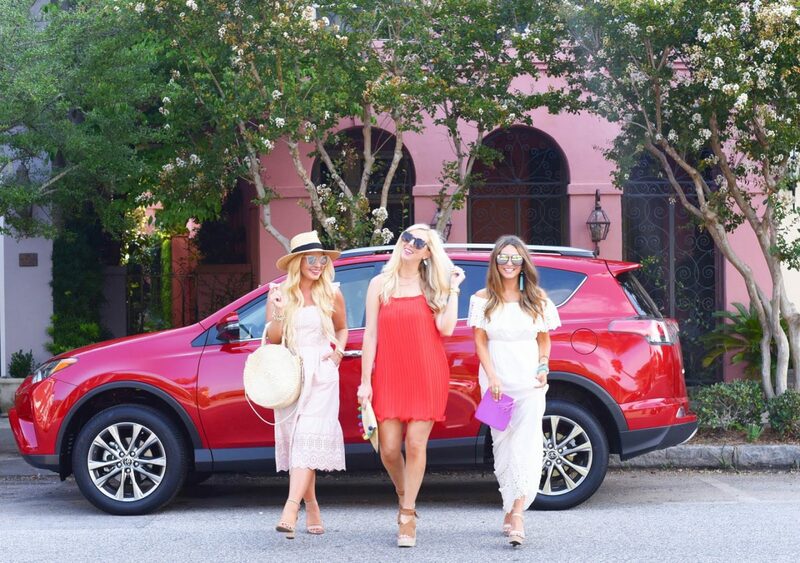 Cortney, Sara & I had SO much fun in this cute little SUV. It was the perfect size for all of our stuff but compact enough to whip around the city. The three of us also met with a photographer one afternoon and shot 3 looks. 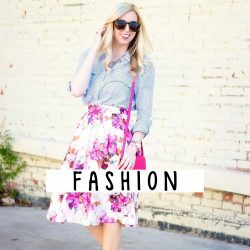 If you’re unfamiliar with what that looks like- think 3 complete outfits for 3 bloggers. That means 9 pairs of shoes, 9 handbags, 9 sets of jewelry, 9 outfits, etc. WHOA. I can confidently say the backseat of our RAV4 was the perfect dressing room to hold all of our stuff & allow us room to swap outfits! Charleston is so fun! Definitely my favorite place for a day trip! Charleston looks like the cutest little place! Definitely somewhere I want to visit now. I really reallyyy want to visit! I'll definitely have to come back to this post if I ever get a chance to visit! I'm bookmarking this! Such a great guide! Charleston is such a dream, Im glad y'all had so much fun! 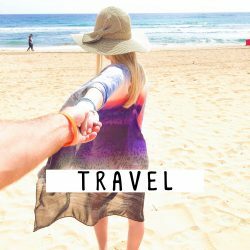 this looks like a darling trip! 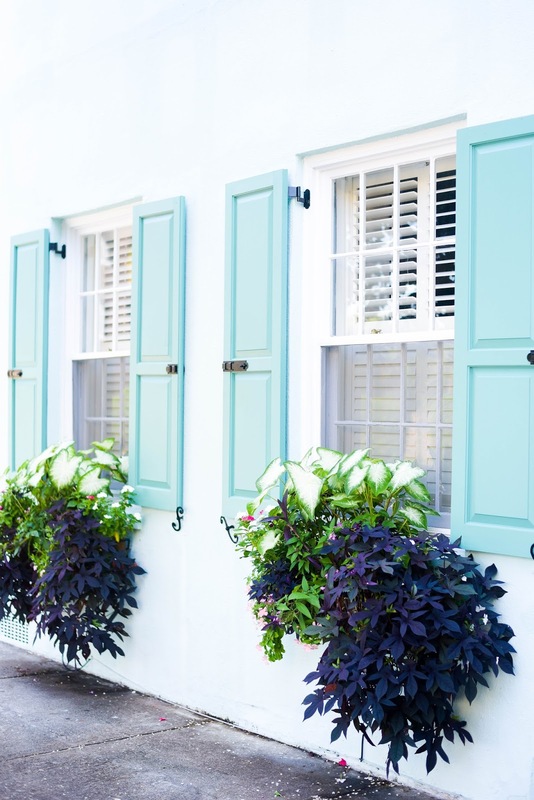 Charleston is on my bucket list! Charleston looks so pretty! It's definitely on my bucket list! Ahh okay you have to spill about what JD was like!!! I'm a huge southern charm fan!